A presentation by Terry White on Photoshop and Lightroom tips (what else?) 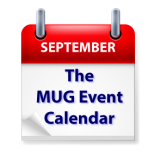 to a Michigan group is at the top of this week’s MUG Event Calendar. A group in Oregon will look at iOS, a New York group will discuss video streaming, and a New Jersey group will talk about AirMail, an excellent alternative email program. Other topics for the week include photography, Apple TV, photo books, technology in the classroom and more.